BON HOFFA (AUS) (2002). 9 wins to 1700m, MRC Sir Rupert Clarke S., Gr.1. Sire of 221 rnrs, 134 wnrs, inc. SW Bon Aurum (MRC Sir Rupert Clarke S., Gr.1), Bons Away, Deiheros and of Top Sight, Sweet Emily, Bon Amis, Don't Give a Damn, Best Hoffa, Gibbon, Sallanches, Ambitious Speedy, Ample on Offa, Bon Elise, Bonee Tess, Galaxy Warrior, Good Offa, Hoffsetter, Never Without You, Vintage Bon, Allez Chival, Bon Rocket, I'm Ablaze, What a Buzz, etc. SET SQUARE (f. by Reset). 3 wins from 1600m to 2500m, A$883,250, VRC Oaks, Gr.1, MRC Ethereal S., L, 2d VRC Vanity S., Gr.3, MRC Cape Grim Beef P., 3d VRC Turnbull S., Gr.1, MVRC Dato' Tan Chin Nam S., Gr.2, VRC Schweppervescence Trophy, Gr.3, 4th MRC Naturalism S., Gr.3. Sallanches (f. by Bon Hoffa). 3 wins. See below. Ayos Ba. 7 wins to 1400m to 2017 in Philippines. Amazing Grace. 4 wins to 1500m in Philippines. Rothschild Lad (g. by Okawango). 9 wins from 1200m to 1600m, A$99,312 in Aust. La Nesra (f. by Bianconi). Placed at 3 in Aust. Ricky's Girl (f. by Gilded Time). Placed in Aust. Dynastar. 7 wins. See above. Regal Honor (Vice Regal). 2 wins at 1200m, 1250m, HKJC Awapuni H., 2d Wanganui Guineas, L.
TESTAFIABLE (Testa Rossa). 3 wins-1 at 2-from 1100m to 2500m, A$772,550, South Australian Derby, Gr.1, VRC Carbine Club S., Gr.3, MRC Allan Wicks 2YO P., 2d AJC Craven P., Gr.3, GCTC Ken Russell Memorial Classic, L, 3d Australian Derby, Gr.1, QTC Sires' Produce S., Gr.1, AJC Stan Fox S., Gr.2, MRC Tsunami Relief 2YO P., QTC Seven Fifty 2YO H. Sire. MARKY MARK (Makfi). Champion 2YO in NZ in 2014-15. Top on The 2014-15 NZ 2YO Free H. 5 wins-3 at 2-from 1100m to 1600m, NZ$230,575, to 2016-17, Manawatu Sires' Produce S., Gr.1, ARC Eclipse S., Gr.3, BOP RC Gartshore Construction H., 3d ARC South Auckland Racing Club Cup, Manawatu RC Landmark Homes H., 4th ARC Diamond S., Gr.1, Hawke's Bay Guineas, Gr.2. He's Blushing (Salieri). 11 wins-1 at 2-to 1400m, ARC Cambridge Stud Sprint H., STC AWA Gaming Club Systems Welter H., Canterbury Welter H., 2d QTC Lightning H., Gr.3. (Mr) Satisfaction (Tights). 8 wins to 1200m, VATC Forrest H., ARC Trevor & Stephen McKee Sprint H., WRC One World of Sport 3YO H., 3d VRC Bob Hoysted H., L.
MULTIGLORY (King of Danes). 6 wins to 1400m, HK$5,380,500, HKJC Sprint Cup, L, Dublin H., Taipa H., Harlech H.
Notwithstanding (Nassipour). 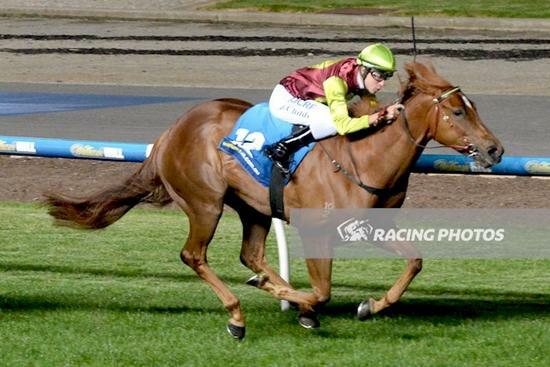 3 wins from 1400m to 2000m, A$139,430, VRC Bargain Box Fabrics Welter H., 2d Moonee Valley Gold Cup, Gr.2, 3d VRC Dalgety H., Gr.2, VATC Coongy H., Gr.3. The Almighty One (He is Risen). 6 wins-1 at 2-from 1200m to 2050m, NZ$31,625, A$124,750, BTC Marco Polo East West Cuisine H., MRC Carlton Draught H., WRC Skipper Roofing 2YO H., 2d ARC Great Northern Foal S., L.
PRESENTLY (Unbridled's Song). 10 wins-1 at 2-to 1250m, A$476,320, AJC Hall Mark S., L, Show County H., L, 2d STC Frederick Clissold S., Gr.3, Star Kingdom S., Gr.3. NEW PREDATOR (New Approach). 5 wins from 1200m to 1600m, R1,861,500, to 2016-17, Greyville Drill Hall S., Gr.2, Turffontein Charity Mile, Gr.2, Citizen P., Vaal Racing It's a Rush P., 2d Turffontein Dingaans H., Gr.2, Hawaii S., Gr.2, 3d Greyville Mercury Sprint, Gr.1, Turffontein Horse Chestnut S., Gr.1-twice, Johannesburg Spring Challenge, Gr.2, 4th Greyville Gold Challenge, Gr.1. SERENA MISS (Iffraaj). Top Filly on The 2014-15 NZ 2YO Free H. 3 wins-2 at 2-to 1400m, NZ$214,375, Matamata Breeders' S., Gr.2, Waikato RC James & Annie Sarten Memorial S., Gr.2, Christmas in Centennial 2YO H., 2d WRC Wakefield Challenge S., Gr.2, Hawkes Bay Gold Trail S., Gr.3, Wanganui JC Veandercross Juvenile P., 3d New Zealand Two Thousand Guineas, Gr.1. WEISSMULLER (Handsome Ransom). 8 wins from 1200m to 2100m, NZ$149,585, A$15,075, to 2016-17, Wellington S., Gr.3, Waikato RC NZ Horse Magic H., Wairoa RC Wairoa Cup, CJC Canterbury Club Luncheon H., Lindauer H., Wanganui JC Dave Hoskin Carriers H.
TRAVOLTA (Handsome Ransom). 6 wins from 1300m to 2400m, NZ$46,800, A$457,910, ATC Cup, L, ATC Australia Day Cup, L, 2d ATC Summer Cup, Gr.3, Mornington Cup, L.
Wants a Gift (Zamazaan). 5 wins from 1600m to 2000m in Malaysia, 2d Singapore Gold Cup, L, 3d MVRC Moorabbin H., VATC NEC Home Electronics H., 4th Singapore Derby, L.Class 1 winner in Malaysia. 3 wins at 1150m, 1200m to 2016-17, MVRC Sweeney Estate Agents H.
Served by Holler. Date of last service, 10.10.2017.